Form: A shrub or tree, depending on cultivar and pruning. Growth rate: Slow to establish, then rapid. Mature Size: 3-30' high and 2-20' wide. Often 15' x 10' if not pruned. 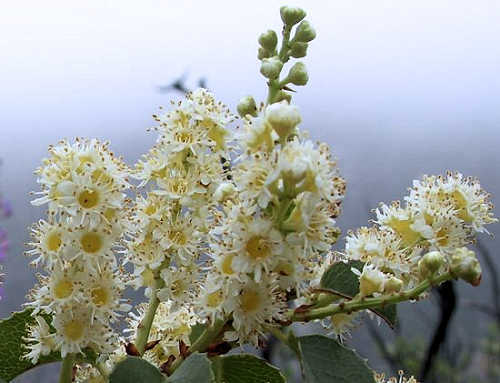 Flowers: Small, short white petals, longer white stamens, in spiked clusters, fragrant. Bloom: Late winter to spring. Fruit: The red to purple skin is leathery and bitter when not watered, with thin, sweet, edible flesh, and one large seed composed of a toxic center embryo surrounded by a hard outer coating. Months for fruit to ripen: 4. The fruit are fully ripe when dark red to purple. Storage after harvest: The fruit are normally consumed immediately. Leaves: Glossy, green, serrated edges with sharp points, having an almond-like aroma when crushed. Stems: Reddish to grayish brown bark on young stems, with the odor of bitter almonds (hydrogen cyanide) when scratched, grayish old bark, fairly smooth, no thorns. Roots: The widespread root system provides erosion control. It can re-sprout from its root crown after a fire. Some specimens sold in nurseries may be hybrids of the two subspecies. Wildlife: It attracts bees, butterflies, birds, mammals, and is a caterpillar food plant for the Pale Swallowtail, Western Tiger Swallowtail, Lorquin's Admiral, and Western Elfin butterflies. It must be protected from browsing animals. Toxic / Danger: All parts of this plant are poisonous except its ripe fruit. The fruit can cause digestive upset in large quantities. The center embryo in the seed is toxic. Origin: Coastal California and Baja California. USDA hardiness zones: 8b-9 (15°F) when five years old, 9 (20°F) when young. Sun: It grows on north-facing slopes in the wild and needs afternoon full shade and possibly all day open shade when temperatures exceed 90°F. Water after becoming established: Monthly to weekly. More frequent watering improves the quality of the fruit. Soil: Well drained, dry, low to high organic content, pH 6.1-7.8 (slightly acidic to slightly alkaline). Fertilize: Not required. Add compost once in mid-winter if desired. Mulch: Use compost to protect the roots from temperature extremes. Planting: Not suitable for a container. First Year Care: Protect from freezing temperatures. Prune: It can be shaped into a shrub, hedge or tree. Propagation: Cuttings. Seed are viable for about 9 months, sprout in 20-40 days. Uses: Ornamental, bird and butterfly garden, hedge, erosion control on slopes, fruit. Native American tribes removed the seed's toxic center embryo and ground the hard, outer seed coating (endocarp) into flour. The center embryos could be leached with many changes of water to remove the toxins and then cooked with the rest of the seed. The fruit was made into a fermented beverage. 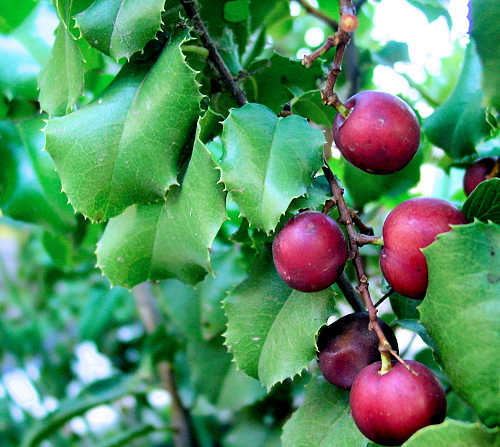 This plant, native to the Californias, is a member of the rose family (Rosaceae) and is related to apricots, cherries, peaches, and plums. The young plants are frost-tender. It is often grown as an ornamental, but the ripe fruit are edible.